The big news for at least the last week has been the iPhone 5 and the millions of people who want or have already purchased one — Apple has yet another massive hit on its hands. However, the real action for the vast majority existing iPhone and, for that matter, iPod touch and iPad owners is software — iOS 6 adoption is soaring. News flash — the iPhone 5 is sold out, or nearly so, just about everywhere around the United Sates and pundits say when the dust has cleared Monday morning eight, 10 or more million will have been sold over the weekend. That is a lot, but a relative drop in the bucket compared to the active iOS user base, which is some number less than the 410 million iPhones, iPod touches and iPads Cupertino has sold to date. And, for all of those folks unable or unwilling to pay $199 (and up) plus $100 or more every month with a two-year commitment for a new iPhone 5, Apple has good news — many if not most of the 200 new features in iOS 6 (and security patches) are available for free right now just for the taking. Unsurprisingly, people have taking advantage of the offer. According to mobile advertising and web metrics firm Chitika, the response from Apple’s iPhone, iPod touch and iPad customer base has been overwhelming. 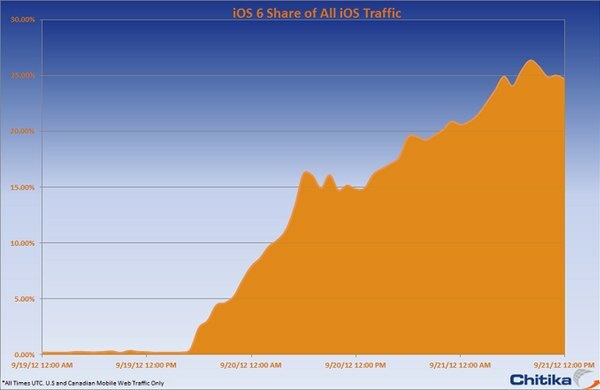 In the first 48 hours after its release, iOS 6 adoption is soaring with 25 percent of users having already downloaded and installed the mobile operating system update — the same version that runs on the iPhone 5. Again, that’s a big number, but how big? Well, last year’s iOS 5 took three weeks to crack 20 percent and 2012’s banner Android update, Jelly Bean, has only attracted 1.2 percent of that platform’s users after two months in the market.